Your Business Redirect Traffic Sign Up! Weight Loss made Easy! Click Here! What do you do when your propane runs out, and you don't have large quantities of wood to devote to cooking? Of course you need some alternate source of combustible material. Wood works great but in conventional wood burning stoves you will waste a great deal of wood in heat energy that didn't go towards cooking the food. The Grover Rocket Stove eliminated that problem entirely by allowing you to use small twigs, leaves, and pretty much any dry plant matter will do, such as weeds, dry sage brush, etc. These Grover Rocket Stoves are made right here in the USA and are built to last a lifetime. These are high quality steel stoves made out of 16 gauge steel produced in the USA and are painted with black high temperature paint to withstand the heat. Buy the Grover Rocket Stove today for only $135 plus get Free shipping to the lower 48 via UPS Ground. Ships within 3 business days. In Stock! No PayPal account needed to check out! Or if you prefer to pay with cash, check, cashiers check, or money order print out an order form and mail it in with your payment. • Stands around 16 1/2 inches tall with the legs attached. - 11" without legs - Top surface 8" wide. Widest area of stove when together 12 1/2"
• Insulated with perlite which will never brake as clay does! • Steel handles for easy portability and dumping of ashes. • Portable fun for the kids to cook hot dogs, or to boil water, or cook serious meals. • Extremely efficient, you can cook a meal with extremely small amount of wood. • Three removable legs on the Grover Rocket Stove for easy transporting. • Burns extremely efficiently, and is easy to carry with two handles. There always seems to be a lot of twigs and small branches in yards with trees, and in camp sites but no large firewood in sight. But as we've discussed, that's not a problem for these Grover Rocket Stoves, you can burn anything that's dry from grass, to bark! 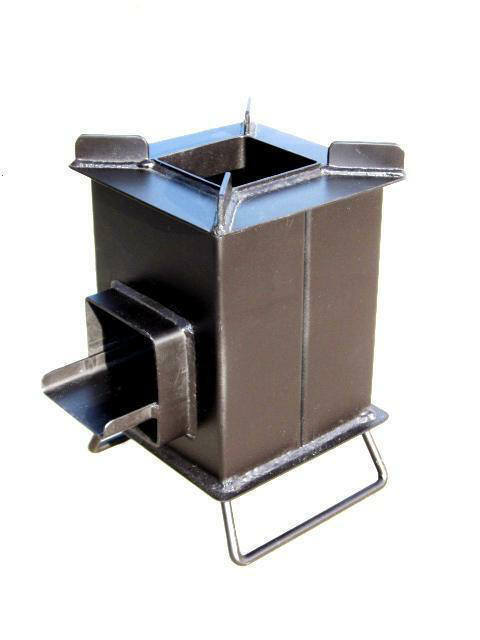 This Grover Rocket Stove is designed for cooking purposes and not for heating spaces being that it is insulated inside it to force the heat out the top of the stove where your cooking and not outwardly on the sides. This makes the Grover Rocket Stove very efficient for cooking. The popularity of this type of stove is rapidly rising in the United States and other areas of the world due to excessive energy costs. With the obvious growing economic unrest we are experiencing people are flocking to ideas such as the Grover Rocket Stove to ensure they'll be eating hot meals no matter how bad their economic situation becomes. These Rocket Stoves have a rounded steel bar which is also an additional handle bar that is coming out around of the bottom opening for feeding longer pieces of wood into it. There is a flat tongue inside the feeding pipe that allows air to draw underneath the wood to fan the fire. At a picnic one time we used three quarters of a 4 gallon bucket with wood and cooked for 5 hours and ate hotdogs, corn on the cob, potatoes and marshmallows. When starting a fire in the Grover Rocket Stove, don’t over stuff it being that you want air flow to get the fire going. A small piece of rolled up paper or some dried leaves can get it started and you can use small twigs and branches or wood that you've split with a hatchet to feed the fire. Lighting a fire in these rocket stoves usually takes only one match, but it will take a little practice to get use to building fires in them. Wad up two or three small pieces of paper and drop them down the top of your Rocket Stove so that they can drop right to the bottom of the rocket stove. Next put two pieces ¼ inch by 7 inch kindling in the feed hole and drop a couple of additional one inch size wads of paper down the top. You can also drop two or three 4 inch long and ¼ inch diameter kindling pieces of wood down the top to get it started. Next roll up a piece of newspaper or start a twig on fire, and put it into the rocket stove under the plate into the bottom chamber, this chamber is used as the air intake after the fire gets going. If you have a shortage of newspaper, you can use junk mail/magazines etc, which for us is a virtually endless supply. Experimenting with lighting your Grover Rocket Stove you will find new ways of keeping it going. I have found that after the chamber heats up you can increase the size of your wood (if you have access to larger pieces) so you won't have to tend it as much. Also I have found before placing any pots on top, give it a few minutes to burn until the there is some hot ashes inside, otherwise you might cause the fire to smother causing it to smoke more. Everyone develops their own method for getting a fire going in their Grover Rocket Stoves that will work best for your outdoor cooking. When you are finished cooking and your Grover Rocket Stove has cooled down, you can use the handle and gently bump the tongue on the ground to dump out the ashes and is ready to use again for your next meal. Buy the Grover Rocket Stove today for only $135 plus get Free shipping to the lower 48 via UPS Ground. Please call or email for Hawaii, Alaska & Canada for shipping estimate. In Stock! For the Grover Rocket Stove our return policy gives you 14 days from the date your stove was delivered to return it for a full refund minus the shipping fees. Used Grover Rocket Stoves and Tent Stoves cannot be returned being they cannot be resold as they are. For all other products we sell, you have 14 days if wanting to return them minus the shipping fees. Buy the Grover Rocket Stove today for only $135 plus get Free Shipping to the lower 48 via UPS Ground. Please call or email for Hawaii, Alaska & Canada for shipping estimate. Ships within 3 business days. In Stock!